Make our gluten free gnocchi and toss it with this sauce for a rich and satisfying meal where you’ll never miss the gluten. Heat pan over medium high heat and add olive oil. When olive oil is hot, add garlic and saute 20-30 seconds; add sausage eat and break up as it cooks. Add spinach and mix well until wilted. Add ½ C heavy cream and bring to a gentle boil. Simmer 4-5 minutes until thickened. Add gnocchi and mix well until gnocchi is heated through and all the ingredients have melded. Add more cream as needed. To with parmesan cheese and serve immediately. 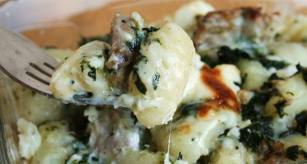 This entry was posted in Main Courses, Recipes, Recipes from Adrienne's pantry and tagged cream, gnocchi, Italian sausage, parmesan, potato, potatoes, spinach. Bookmark the permalink.